Simha Sankranti (सिंहा संक्रांति) marks the day when the sun moves from Karka Rashi (Cancer) to Simha (Leo). 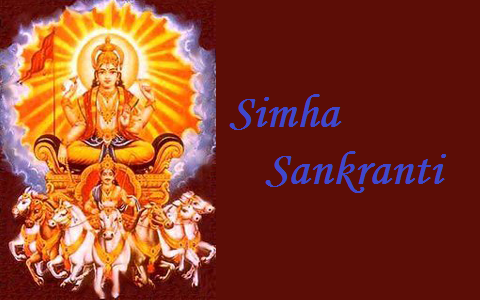 Simha Sankranti marks the beginning of Malayalam calendar in Kerala. Similarly, Avni Masam begins in the Tamil month on the day of Simha Sankranti. Sankranti in general signifies the movement of Sun from one Rashi to the other. 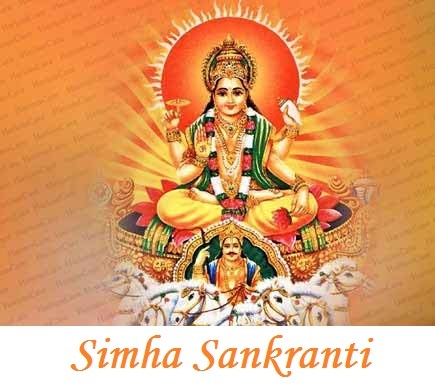 Simha Sankranti as other Sankranti festivals is unique as one is able to expel out darkness from the life on the occasion of Simha Sankranti and usher in an era of prosperity. Devotees who offer traditional offerings to the Sun God, Lord Vishnu and Lord Narsimha Swami, are blessed with a dignified life.